Bottesford absentee voters list - completed on the next image. The United Kingdom general election of 1918 was called immediately after the Armistice with Germany which ended World War I, and held on Saturday 14 December 1918. It was the first election to be held after the Representation of the People Act 1918. It was thus the first election in which women over the age of 30, and all men over the age of 21, could vote. Previously, all women and many poor men had been excluded from voting. In general election of December 1910 the parliamentary seat of Melton Mowbray had been won by Charles Edward Yate from the Liberals who had held it in the two previous general elections in 1906 as and January 1910. Yates was returned unopposed in 1918 and went on to successfully defend the seat for the Unionists in 1922, 1923 and 1924. A feature of the 1918 election was the importance given to ensuring that men in the armed forces were included in the electoral roll. An act of Parliament passed on 6 February, 1918, allowed service men to register in order to obtain a vote in the constituency of their home address. Voters details were initially supplied by the next of kin of the household of the soldier to local voter registration officers. Once this process was completed, the names of those in the army were sent to the Adjutant General’s Department of the War Office, who then arranged to send voting cards to soldiers who were in the United Kingdom and ballot papers to men in France, Flanders and Italy. Men serving in more distant theatres of war were allowed to vote through use of a proxy voting form. The hurried and rather haphazard nature of collecting the original information at home meant that some men were missed out altogether and the details given for others often inaccurate. The first Absentee Voters lists were published on 15 October, 1918 from applications received up to 18 August, 1918, and a second list was published on 15 April, 1919. 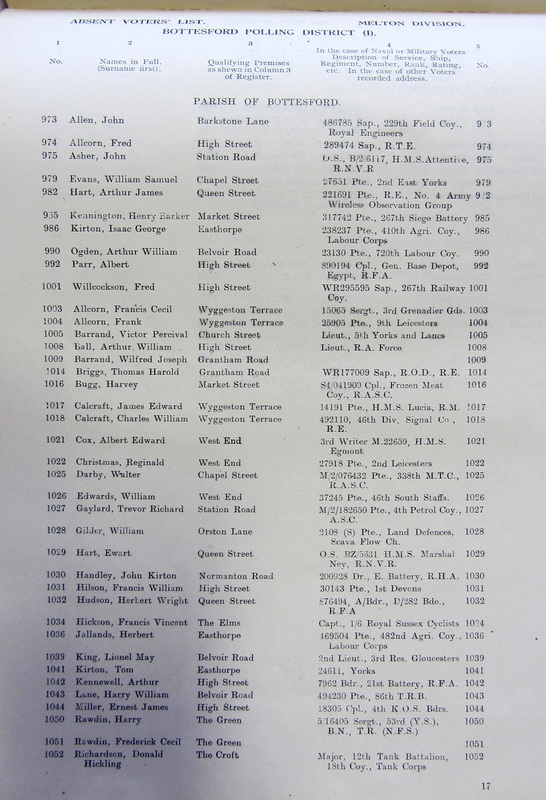 The lists recorded their regiment, number and rank at the time, as well as home address. Sadly, there is no surviving central register of Absentee Voters, and many individual lists have not survived. 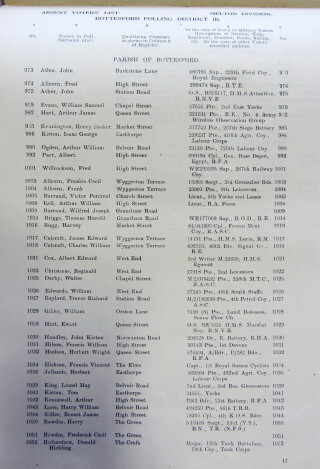 We are fortunate in that the List for Bottesford and Muston is kept in the Leicestershire Record Office at Wigston Magna. These lists are valuable in that they link names, addresses and service histories of men who survived the fighting. Many of those from Bottesford are also found on the ‘church organ’ list, but not all. The Bottesford list includes some men whose service careers we were not previously aware of, and this is also the case with all those on the Muston list. The following tables are a transcription of the absentee voters lists for Bottesford and Muston, respectively. Allcorn, Fred High Street 289474 Sapper R.T.E. Asher, John Station Road O.S., B/2/6117 HMS Attentive, R.N.V.R. Bugg, Harvey Market Street S4/041909 Corporal Frozen Meat Coy, R.A.S.C. Gaylard, Trevor Richard Station Road M/2/182650 Private 4th Petrol Company, A.S.C. Gilder, William Orston Lane 2108 (S) Private Land Defences, Scapa Flow Ch. Hart, Ewart Queen Street O.S. BZ/5631 H.M.S. Marshal Ney, R.N.V.R. Handley, John Kirton Normanton Road 200928 Driver E Battery, R.H.A. Hudson, Herbert Wright Queen Street 876494 A/Bdr D/282 Brigade, R.F.A. Kennewell, Arthur High Street 7962 Bdr 21st Battery, R.F.A. Lane, Harry William Belvoir Road 494230 Private 86th T.R.B. Silverwood, Arthur Edward High Street 2nd Lieutenant P.O.W. Silverwood, Robert Charles High Street 41247 Private 16th H.L.I. This page was added on 09/11/2015.